Baan Tong Luang is a hill tribe exhibition village situated in the Mae Sa area about 30 minutes drive from Chiang Mai. This village has been set up to display the lifestyles and cultures of five different hill tribe groups which typically reside in the north of Thailand. 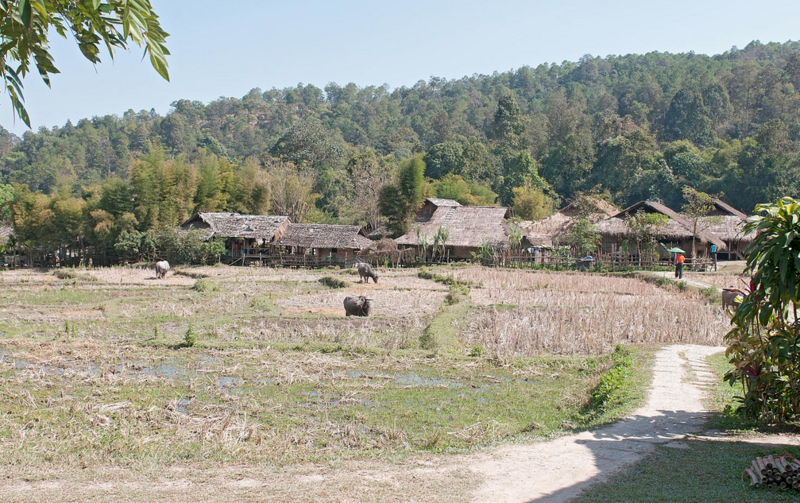 The village is separated into around five zones with each hill tribe ethnic group residing in its own zone. At Baan Tong Luang you will find, Akha, Lahu, Lisu, Karen and Padaung (Karen Long Neck). The village is quite picturesque and nestled in amongst the paddy fields and foothills of Doi Suthep/Pui National Park. The ethnic groups do live in the village but you will notice that most are elderly, children, or mothers looking after their children, most of the men and women of working age are out at work, many probably in the city of Chiang Mai. 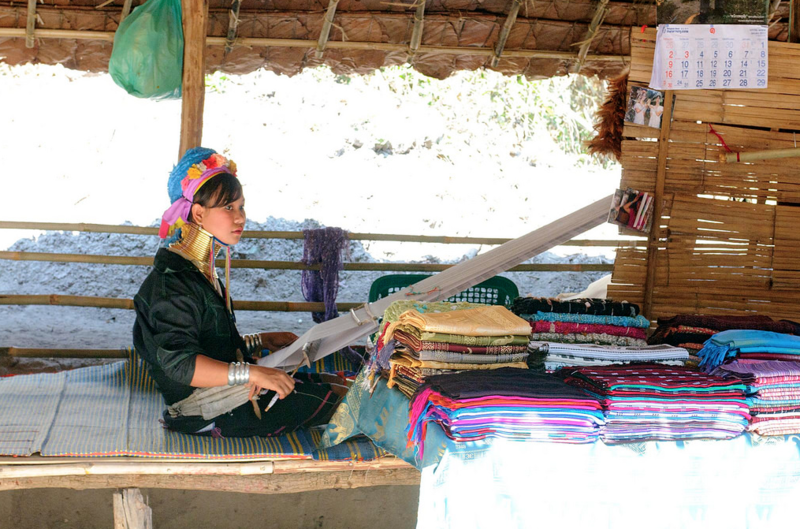 Craft and nik nak stalls feature prominently here and are a way for these local hill tribe people to supplement their income. Many of the crafts and nik naks sold are brought in but many are also locally produced in the village by the villages themselves. If you are considering buying something then try to buy something locally produced in the village. The villages benefit directly by what they sell. Visiting hill tribes this way is not everyones cup of tea but if you are short of time and would like to see the Karen Long Neck and other hill tribes groups then this might be the best bet. Most of the people here dress in their traditional dress which makes for some great photographic opportunities. If you have the time (and energy to spare ) then it is well worth making the effort to trek up into the hills around Chiang Mai to see hill tribes in their natural surroundings and villages but many do not have the time or energy to do this then Baan Tong Luang offers an alternative option for those who want to get a quick insight into a number of the different ethnic groups residing in the north of Thailand. Charter a tuk tuk or taxi – Many tuk tuk and taxi drivers will be happy to take you out here, If you are taking a tuk tuk or taxi then consider adding in some of the other attractions in the area. The chartering of a tuk tuk or taxi can be surprisingly cheap, especially if you are visiting a few attractions as they do pick up commission from many of the venues in this area. 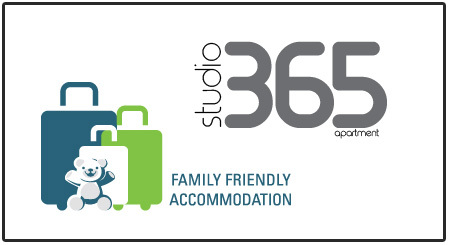 Most drivers will offer a very good rate for a half day hire especially if you are visiting a few attractions. On an organised tour – Travel hub offers a visit to Baan Tong Lunag on its T1023 Chiang Mai Highlights and hill Tribes tour.